McALLEN — Representatives from the city’s four consulates met Wednesday to mark the three-year anniversary of a multinational consular group that started here and has since spread to cities across the nation. 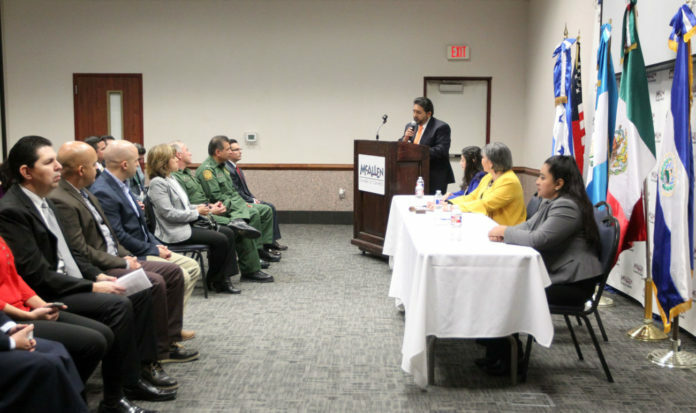 The consul generals of Central America’s Northern Triangle — Honduras, El Salvador and Guatemala — and Mexico in McAllen formally launched TRICAMEX in December 2015 to share best practices and resources after months of informal talks borne out of the 2014 Central American migrant crisis. The Honduran and Salvadoran consulates opened downtown in May and August 2014, respectively, following an influx of children and families crossing into the Rio Grande Valley from Central America. Three years since the formation of the consulate group, immigration remains its central focus, with the consul generals spending much of November focused on the potential impending arrival of migrant caravans from Central America. Although the first caravan chose the Tijuana border crossing as its final destination, Eduardo Bernal, Mexico’s consul general in McAllen, said Mexican authorities along the Texas-Mexico border were prepared to receive the group. A baseball stadium in Reynosa had been designated as a shelter for the migrants, he said. The Honduran government had also sent additional staff to the Honduran consulate in McAllen in anticipation of receiving hundreds of migrants in need of consular assistance, said Ana Bulnes, Honduras’ consul general. Those staff have since been sent to Tijuana to install a mobile consulate to document the number of migrants seeking asylum in the U.S. and assist those who wish to return to Honduras. “Adults can go some time without eating; children cannot,” she added. 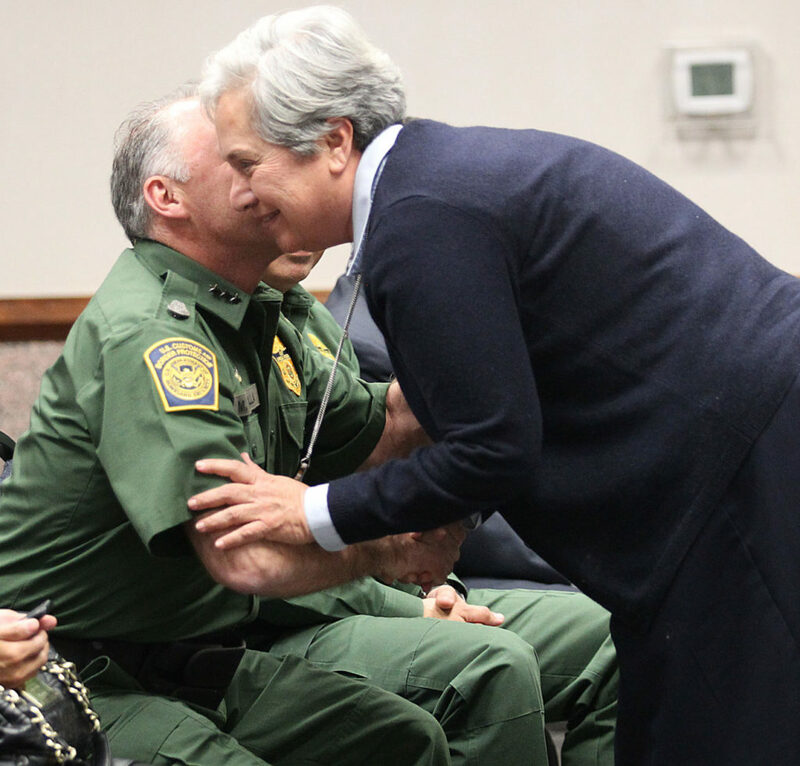 The consuls were joined Wednesday by Sister Norma Pimentel and Manuel Padilla Jr., chief of the Rio Grande Valley Border Patrol Sector with whom they work closely to provide consular assistance to migrants at U.S. Customs and Border Protection’s McAllen processing center. In conjunction with CBP, the consulates in McAllen have launched various informational campaigns warning citizens of their countries about the dangers of migrating to the U.S. illegally. Padilla described TRICAMEX, which meets with CBP and other federal agencies, local law enforcement agencies and local government officials at least once a month, as “a diversity of ideas” aimed at addressing cross-cutting issues affecting the Valley and countries south of the border. “They were a lot of help in giving us information on what was behind the caravans, why now … the dynamics of the caravan they were very helpful (with) since they know their countries,” he said. The governments of Mexico, Honduras, El Salvador and Guatemala formalized the TRICAMEX initiative in December 2016. The consular working group has since been implemented in all U.S. cities where all four consulates are present.